The most important starting point for any grain producer to manage a sustainable farm is information. In the first place, we have to know what is going on in our soil and what the needs of the plant are to ensure optimum production, and then we must do all we can to reconcile the two. However, in many cases the only land to which some of our new-era producers have access is marginal and neglected land that takes years and is also very expensive to build up again. 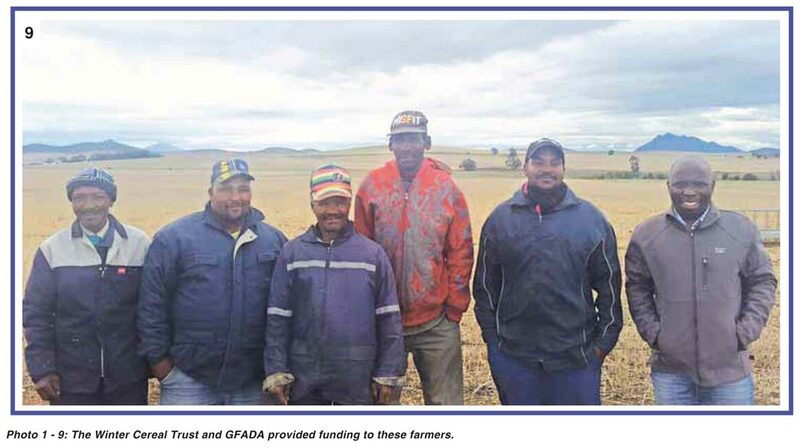 This need was recognised by the Winter Cereal Trust and their implementing agent, GFADA (Grain Farmer Development Association), and they decided to do something about the situation by providing funding. Grain SA applied for this funding on behalf of the new-era producers in the Western Cape, after which GFADA made about R2,1 million available to various new-era farmers in the Overberg and Swartland for grid sampling, lime and the precision application of the lime. This aid will definitely make a great change to the production systems of these farmers, and constitutes the foundation of the progress on their farms. Firstly I would just like to say thank you for everything you are doing for us at Theewatervlei Farm. We are grateful for all the effort and the problems with which you assist us. This will be the first time in 19 years since we have been on the farm that we will be able to spread lime. Financially it will also help us a lot. Thank you to all the funders who donated this to us, we really appreciate it. Theewatersvlei. From the side of Suurbraak Grain Farmers just a big thank you for the assistance with the soil analyses, lime purchases and spreading costs. The soils in the Southern Cape are well-known for requiring a lot of lime. 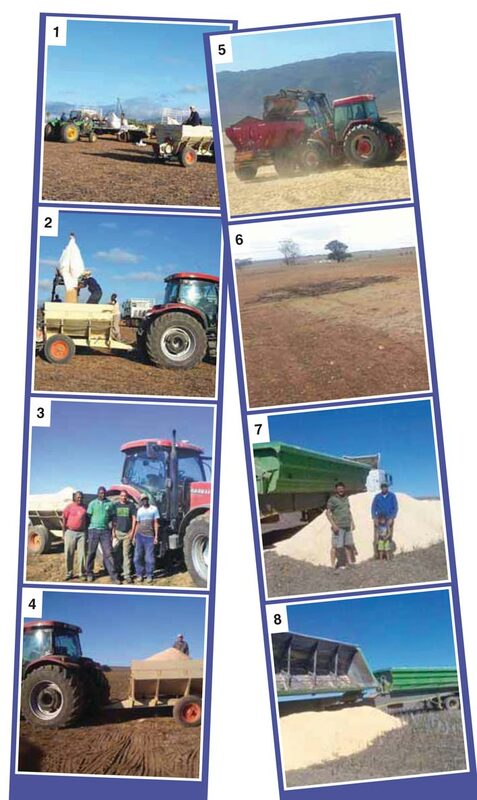 The old adage here is that lime is your cheapest but also your best source of fertiliser. Because the land of the members of Suurbraak Grain Farmers is located virtually against the Langeberg Mountains, the soil is naturally very acid, with a low pH. Since we started with the project, we have placed a high premium on the rehabilitation of the nutritional status of the soil. The land was for many years only ploughed and sown, with little liming taking place. This donation made it possible for us to rectify things in all our fields this year where we had not done anything in the past. Once again thank you very much for rolling out this programme for us new-era producers. Together we help to create a new future with hope for all! Suurbraak Grain Farmers. We, as Agri Dwala, want to thank the Winter Grain Trust and everybody involved in the process of sponsoring lime, the application cost and grid sampling. We are very grateful and it helps a lot with the managing of our input cost. We were able to balance our soil with the lime application for maximum yield potential. Agri Dwala. The lime was at the right time in the right place. It is one of the greatest gifts that Genadeshoop could have received. What a blessing, I want to say thank you very much to you. The lime puts us in a position to improve our soil and bring back life and it was also applied in the best manner. We were able to spread with a precision control spreader and this also opened our eyes to savings on unnecessary purchases of lime. Thank you very much that you invested in us as emerging producers and played a role in getting us to be sustainable and successful. Genadeshoop Farm. The donation and application of lime will have a positive impact on the farming operations. As this farm is operated on a wheat and medics crop rotation system, the pH levels are vital. These corrections of the pH will reduce the risk for the cultivation of wheat and medics for the next three to four years to a great extent and will also contribute to optimum yields. Thank you very much for the assistance with a very important resource in the cultivation of crops. Knolkop. of the Grain SA Farmer Development Programme. For more information, send an email to liana@grainsa.co.za.